When there is a choice, I nearly always go after the elk with the nicest antlers. While everyone has opinions on what "nicest" means, I generally look for overall size (bigger is better with age, genetics and nutrition aiding this aspect), symmetry (or character if something unusual is present), shape (classic shape with long curved tines and a big whale tail) and color (dark with ground-polished white tips is perfect). This bruiser checked most of those boxes and in this position, his primary flaw, a missing G2 (second point from the base) on the left side, is nicely hidden. This 6x5 had not long ago lost a fight with a bull with antlers that were smaller overall. In the battles, it is often the size of the elk's body that matters most and this one needed to go eat more. He is still talking to the nearby herd with a bit of food still in his mouth. This pursuit started not too far from the car, but I eventually ended up on a ridge a good distance from where I parked. When a light rain ensued, I was thankful for weather sealed gear as I did not bring a backpack and would not have been pleased to have to leave a subject as nice as this one. I usually use a shutter speed faster than 1/400 second when photographing elk. 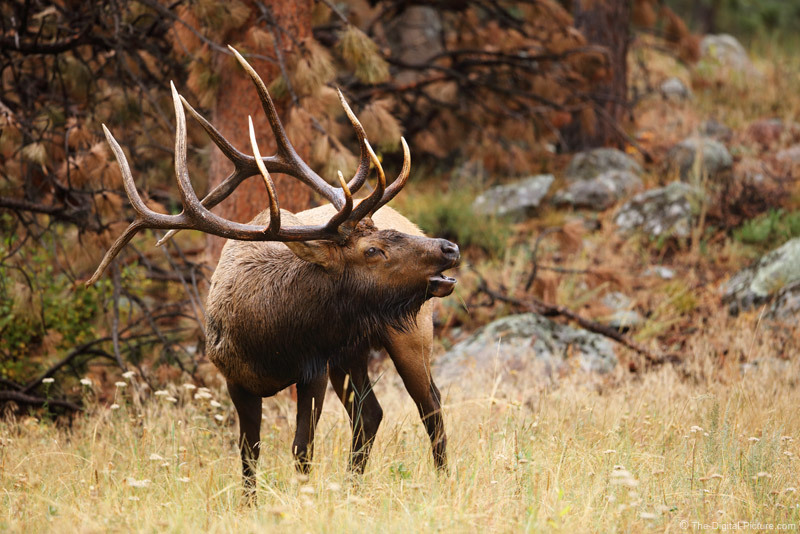 But, elk usually move slowly while bugling. So, I grabbed some immediate insurance shots and then rolled the shutter speed down to go after lower noise images. Manual mode was selected with a wide open aperture and auto ISO adjusting for the shutter speed change I made.